It’s a man’s world’ so they say, but throughout history and in modern times, women too have played an important part in society. In fact, some of these highly influential women entrepreneurs have surpassed their male equivalents. From powerful leaders to media moguls, women often have had to battle against far tougher offs than their male counterparts to get their respective positions of influence. This article identifies 10 Of The Most Influential Women Of Our Time. Whilst Facebook was certainly very popular before she came on board in 2008, it was difficult to see how the site would make an income worthy of its valuation. Not only did she help meet those expectations that came with such a high valuation of a site yet to make a real income, she helped massively exceed them. Since she came on board as Facebook’s number two, it’s user base increased more than 10 times to roughly 11% of the world’s population, and the business is on course to post massive profits that are rumoured to cause the company to be valued near the $100 billion mark, which is almost as much as half the GDP of Ireland. It was her task to monetize Facebook, and she did this very successfully. She would have been much higher in the top ten if it wasn’t for the fact that Facebook was destined to conquer the world on account of it being a very good idea, but everything she was tasked to do, she did very well and deserve her place amongst the top ten women entrepreneurs. This single and struggling mother wrote a book that bought a generation of video gamers and tv addicts back to reading books to excercise their imaginations once again. Another rags to riches story, JK Rowling‘s Harry Potter books have become one of the best-selling books of all time, she managed to spawn a major feature film series and a franchise that also incorporates a fully functioning theme park in direct competition with Disney. Her influence not only affects millions of children around the world, but has also drawn many adults into her world. From a woman who went door-to-door selling fax machines for 7 years, to failing her life long dream of becoming a lawyer then creating “Spanx“, a multi-million dollar undergarment company, you’d say that Sara Blakely is a modern day “Wonder Woman”. Sara Blakely has secured her spot as the world’s youngest self-made female billionaire with a current net worth of Billion. Whatever you think of her music and fashion tastes, theres no denying that she has become an extraordinary success within a very short space of time and one of the most successful women in music today. Earning Lady Gaga her spot as number 8 in the list of top female entrepreneurs. Born Stefanie Germanotta, Lady Gaga is estimated to be worth nearly $100 million at the tender age of 25-years-old. The reason for her fortune is that unlike many of her peers, she actually writes her own music, netting her a huge income in royalties. Susan Wojcicki can certainly claim to be one of the most influential women in business owing to her being Senior Vice President at search engine giant Google, Susan has been responsible for helping to turn a great idea into a very profitable idea. Susan is mostly in charge of the advertising revenue side of Google. 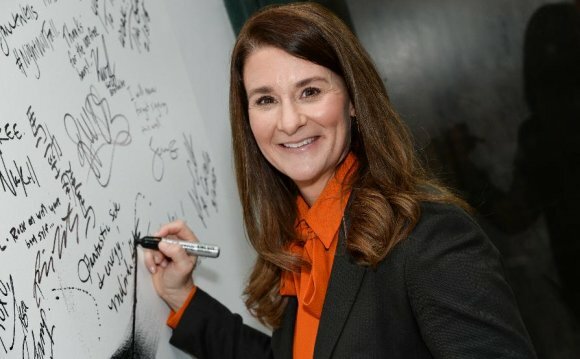 Although her husband Bill Gates is mostly responsible for their wealth, she has been responsible for talking him into co-founding a charitable organisation with the money made from Bill’s empire. Bill Gates has stated that when he dies, all of his billion fortune will have been spent on good causes. Melinda & Bill Gates have already donated billion to charitable causes. Born in Calcutta, India, Indra Nooyi is one of the most powerful women in business having held executive positions in many of the world’s top companies. She is currently Chairwoman and CEO of Pepsico which is the second largest food and drink company on the planet. She has not only excelled in business but also in academia, earning degrees in Physics, Chemistry and Mathematics as well as an MBA in management in her native India, she then went on to earn a Master’s degree in Public and Private Management at Yale. Great responsibility rests on this ladies shoulders as leader of Europe’s most powerful and richest economy, Germany. Her influence and persuasion skills are likely to affect millions of Europeans and billions of others around the world. The global economy effectively is in her hands. Agela Merkel is Germany’s first female leader and her decisions are highly likely to impact the history of Germany. No list of the top women entrepreneurs would be complete without Oprah. Worth an estimated $2.7 billion, it’s no wonder she can afford to hand out free cars to her audience members, her fortune has been largely down to creating television that women love to watch. And not just being content with appearing on the TV, she has gone on to excel in many other forms of media. As for being influential, she has had president Obama on her show twice, amongst many other world-famous people and has donated 100s of millions to make this world a better place. Cher ranks so highly on this list as she is perhaps arguably the most successful female entrepreneur in the world. Her wealth is primarily of her own making rather than being down to working for a large firm or being born wealthy. She spent many years manufacturing cell phones for other people which earned her a tidy fortune, it wasn’t until she set-up her own company HTC, that her wealth really took off. She has an estimated worth of $6.8 billion, her HTC smartphones have quickly gain notoriety and in 2010, accounted for 20% of the smartphone market. Teklynx - rfid und Barcode etiketten software.